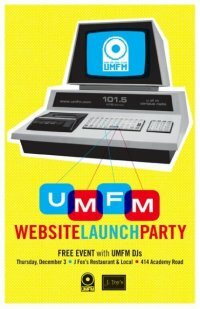 Come join all your favorite UMFM DJ’s & show hosts on Decem­ber 3rd at J. Fox’s pub & local, 414 Acad­e­my, as we have a great par­ty to cel­e­brate the launch of our shiny, new web­site! Be the first on your block to get up close and per­son­al with our new web­site and all of its fan­tas­tic fea­tures, many of which you will be able to use first hand! Music will be pro­vid­ed by a bevy of UMFM’s top tal­ent and the tunes will go until dark! Come min­gle with the show hosts you stalk over the inter­net (who look noth­ing at all like they sound) and help us as we cel­e­brate the birth of a new ear at www​.umfm​.com! All this, and free!